6/30 Cup of Coffee: The PawSox dropped a home game to the Knights, while Portland and Greenville both beat their opponents by convincing margins. The Spinners fell in Vermont, the GCL Red Sox picked up a win, and the DSL Red Sox shutout the DSL Marlins. The PawSox fell 5-2 to the Charlotte Knights (CWS) at home at McCoy Stadium. Pawtucket picked up the game's first runs in the bottom of the second. Mauro Gomez singled to reach base and advanced to third when Andy LaRoche hit a single. Another single from Alex Hassan drove in Gomez and advanced LaRoche to second. In his at bat, J.C. Linares grounded into a force out for Hassan at second but reached base himself and advances LaRoche to third. Che-Hsuan Lin then grounded into a force out for Linares at third, but advanced LaRoche to cross the plate. 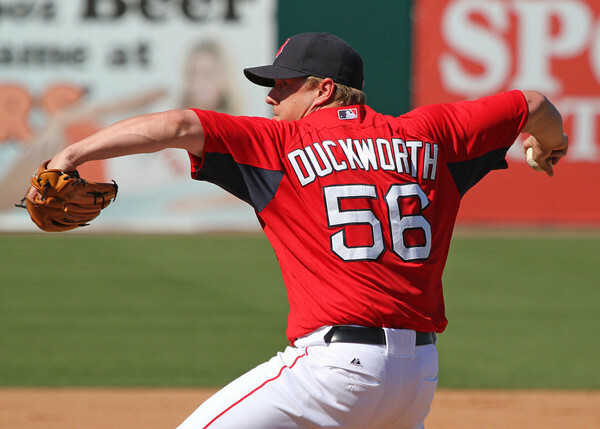 PawSox starter Doug Mathis gave up one run in each of the third, fourth, and fifth innings. Mathis pitched 6.0 innings overall with nine hits, three runs, and two walks. He was replaced in the top of the seventh by Daniel Bard. Right away, Bard was lit up--with a hit, three walks, and a hit batter--all with only one out under his belt. Bard pitched 0.1 innings with one hit, two runs, and three walks and was replaced with one out and the bases loaded by Alex Wilson. In total, Wilson pitched 2.2 innings with one hit, no runs, and one walk. LaRoche and Pedro Ciriaco led the PawSox with three hits each, which helped to contribute to the ten that the team totaled. Five runs in the eighth inning helped Portland to cement a 9-3 win over the New Hampshire Fisher Cats (TOR). New Hampshire drew first blood with a homer in the top of the first off of Sea Dogs starter Stolmy Pimentel. Portland put up their first runs in the bottom of the third. Derrik Gibson led off the bottom of the third and reached on a single, followed by Drew Hedman who reached base on an attempted force out, advancing Gibson and Hedman to third and second, respectively. Jackie Bradley singled, sending Gibson across the plate and Hedman to third. Jeremy Hazelbaker followed up with a double that scored Hedman and Bradley. The Fisher Cats answered with 2 runs in the top of the fourth to tie the game. Pimentel stayed on the mound through the sixth inning, pitching 6.0 innings with four hits, three runs, and one walk. He was replaced in the seventh inning by Chris Balcom-Miller. In the bottom of the sixth, Marquez Smith reached on a double, followed by a groundout from Dan Butler to advance Smith to third. Gibson then singled, scoring Smith and breaking the tie. Balcom-Miller pitched 2.0 solid innings for the Sea Dogs with two hits, no runs, and no walks. In the bottom of the eighth inning, the Sea Dogs broke the lead open with five more runs. Peter Hissey and Gibson both reached base on walks. Hissey and Gibson both advanced in the next at bat thanks to stolen bases, followed by a Nick Natoli walk that loaded the bases. Bradley drew a walk to send Hissey across the plate, followed by a Hazelbaker double that scored Gibson and Natoli. Bryce Brentz then singled, scoring Bradley and Hazelbaker. Brock Huntzinger closed out the game for the Sea Dogs, pitching 1.0 perfect innings with no hits, no runs, and no walks. Portland had 12 hits on the night, three of which belong to Hazelbaker. The Drive traveled to Charleston and blew out the RiverDogs (NYY) 10-2. Charleston put up the first run of the game in the bottom of the first. The drive answered in the top of the second when Boss Moanaroa doubled, followed by a Jordan Weems single that drove Moanaroa in. The RiverDogs put up another run against Drive starter Luis Diaz in the bottom of the second. In the top of the fifth, Bryan Johns reached base on a double, followed by a Jose Garcia bunt for a single, and a Keury De La Cruz double that rove Johns in. Garcia scored and De La Cruz advanced to third on a wild pitch followed by a walk for Garin Cecchini. David Renfroe grounded out, but advanced De La Cruz cross the plate. Diaz pitched 6.0 innings with four hits, two runs, and no walks. He was replaced in the seventh inning by Matty Ott. The top of the eighth was a productive inning for the Drive. Ramos singled, advanced to second with a hit from Drew Turocy, and Weems drew a walk to load the bases. Johns followed with a sacrifice fly to left field that scored Ramos. Garcia then homered, sending himself, Turocy, and Weems across the plate. Ott pitched until the eighth inning, going 2.0 innings with one hit, no runs, and no walks. In the top of the ninth, Matt Marquis reached on a single, Renfroe was hit by a pitch and Moanaroa singled to load the bases. Ramos singled to score Marquis and Turocy singled, scoring Renfroe. Michael McCarthy took the mound to close out the game in the bottom of the ninth. He pitched 1.0 perfect innings, with no hits, no runs, and no walks. Drive batters had 15 total hits in the game, three of which belong to Moanaroa. The Spinners dropped a close 2-1 game to the Vermont Lake Monsters (OAK). The Lake Monsters put up their first run against Spinners starter Zach Good in the bottom of the second. The Spinners put up their lone run of the game in the top of the fourth. Mike Miller and Nathan Minnich both singled, followed by a Kendrick Perkind groundout that advanced the runners. Zach Kapstein then singled, driving in Miller. Vermont answered in the bottom half of the fourth with another run against Good. Despite picking up his second loss of the season, Good had a decent outing, throwing 6.0 innings with four hits, two runs, and three walks. Hw was replaced in the seventh inning by Braden Kapteyn who pitched 2.0 innings with one hit, no runs, and 1 walk. Spinners batters had six hits on the night, Miller accounting for three of them. The GCL Red Sox picked up a 5-2 win against the GCL Twins (MIN). The Twins struck first with a homer against Red Sox starter Mario Alcantara in the bottom of the second. The Red Sox answered with a run in the top of the third when Shaq Green-Thompson drew a walk, stole second base during the next at bat and crossed the plate on a throwing error. In the top of the fourth, David Sopilka reached base on a single and scored thanks to a Jacoby Ellsbury double. In the top of the fifth, Jake Davies doubled, Nick Moore walked, and Sopilka reached base on an attempted force out. Deiner Lopez then drew a walk, scoring Davies. Perez pitched through the fifth, picking up his second win of the season and going 5.0 innings with five hits, one run, and two walks. He was replaced in the sixth inning by Carlos Pinales. The Red Sox added to their lead in the top of the sixth, when Carl Crawford walked, advanced to second on a passed ball, and scored on a Cleuluis Rondon single. In the top of the eighth, Rondon reached base on a throwing error, followed by a passed ball that advanced him to second and a single from Moore that sent Rondon across the plate. Pinales gave up a run to the Twins in the bottom of the eighth and came out of the game after that inning, having thrown 3.0 innings with six hits, one run, and no walks. Gerardo Olivares closed out the game, pitching 1.0 inning with no hits, no runs, and no walks. The Twins out batted the Red Sox 11-8. Lopez led the Red Sox with two hits on the night. The DSL Red Sox blanked the DSL Marlins (MIA) 6-0. Red Sox pitchers Randy Perez and Victor Ramirez stole the show with their impressive combined efforts. Perez started, throwing 5.0 innings with just one hit, no runs, and two walks. Martinez also had a great outing, going 4.0 innings with three hits, no runs, and no walks. Red Sox batters got their first run of the game in the bottom of the fourth when Roberto Duncan rounded the bases with a home run. Andres Garcia led off the bottom of the fifth with a triple, followed by Manuel Margot getting hit by a pitch and Alixon Suarez walking to load the bases. Duncan also drew a walk, scoring Garcia. Pablo Urena reached base on a fielding error, sending Margot across the plate. Suarez scored on a wild pitch during the next at bat. The Red Sox put up their last couple runs in the bottom of the sixth. Margot singled to get n base, stole second, and advanced to third on a wild pitch. Margot scored thanks to a single from Anthony Amaya. In total, Red Sox batters had nine hits, Garcia and Duncan each had 3. Players of the Night: Randy Perez and Victor Ramirez who combined their efforts to shutout the DSL Marlins. Perez, who pitched five innings, allowed just one hit while Ramirez pitched four innings with three hits. Now that we’re three months into the season, Will Middlebrooks and Ryan Kalish have graduated from prospect status, and Boston has signed its top 12 draft picks of 2012, it’s about time to take a fresh look at the top 10 prospects in the Red Sox system. While the system may not be as strong in terms of depth as it once was, there are several high-caliber prospects in the top 10 -- a few of whom are on the cusp of reaching blue-chip status. How acquired: Drafted in the 1st round, 2011. $1,500,000 bonus. Scouting Report: With the 19th overall pick in the 2011 draft -- the club’s highest pick since 2003 -- the Red Sox selected Matt Barnes out of the University of Connecticut. Considered a potential top 10 pick after an excellent summer in 2010 with Team USA, his stock fell due to the impressive pitching depth in the 2011 draft class. A large right-hander with a very projectable body, Barnes features a plus fastball that sits at 93-95 mph and tops out at 98 mph. His command and control, which were identified as developmental areas coming into the season, have been quite solid in 2012. His mid-70s curveball is his best secondary pitch, grading out as solid-average with plus potential. He also mixes in an average mid-80s changeup. His secondary pitches still need refinement, and he may need to re-incorporate a fourth pitch, such as a slider or a cutter, if he wants to develop into a top-of-the-rotation starter. That being said, he’s having a phenomenal season and profiling as a No. 2 or No. 3 starter at this point. Projection: No. 2 or No. 3 starter. Ceiling: No. 1 or No. 2 starter. Last week, Jackie Bradley, Jr. was promoted to Portland after hitting .359/.480/.526 over 67 games for High A Salem. The promotion has not slowed down his production one bit--as of Thursday, he was hitting .367/.441/.533 in his first seven Double-A games. 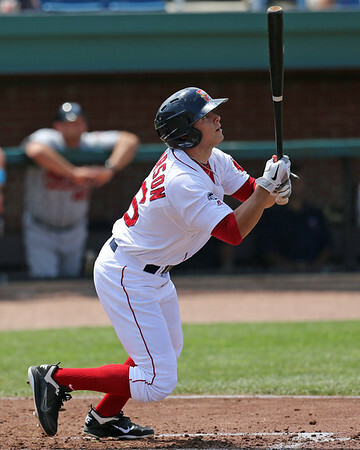 Chris Mellen, SoxProspects.com's Director of Scouting, takes a closer look at Bradley this week in The Book while focusing on the areas of his game that he can continue to work on as he begins to face higher level competition. SoxProspects.com's Executive Editor, Chris Hatfield, gives his view on the moves associated with the promotion of Bradley in his First Take column. The column touches on many of the events of the past several weeks in more detail, including the Kevin Youkilis deal, Jose Iglesias's rehab stint, and Mark Prior heading to the disabled list with a strained oblique. This week Mike Andrews, SoxProspects.com's Editor-in-Chief, broke the news that the Red Sox have signed the top ranked international free-agent out of Asia in Taiwan's Tzu-Wei Lin. The 18-year-old shortstop has an intriguing set of skills, and The Taiwan Baseball Blog provides a more in-depth scouting report. Lin will be assigned to the Gulf Coast League. Mike also wrote a piece this week for ESPNBoston about 23 players who played high school baseball in New England and played in the Major Leagues in the 2012 season. This week the Red Sox finished signing all of their picks in the top 10 rounds of the 2012 draft when they signed left-hander Brian Johnson, the 31st overall pick, and their third-round pick, right-hander Austin Maddox. Both players are out of the University of Florida, and the signings were slightly delayed while UF made their run in the College World Series. Johnson signed for his exact slot value of $1.575 million, while Maddox signed for $350,000, which was just below his slot number of $400,500. The new collective bargaining agreement states that a team can exceed its bonus pool by up to five percent by paying a 75 percent tax on the amount over the pool. If a team goes over its bonus poll by more than five percent, it would be required to forfeit future draft picks, something the Red Sox would almost certainly not be willing to do. They are currently $157,200 over their bonus pool, meaning they have an additional $187,040 available to spend on any unsigned draftees, for whom any bonus money above $100,000 would count against the pool. This limited flexibility makes it unlikely the Red Sox will have any other big signings unless some of their picks are willing to sign for less than expected. Brian MacPherson of the Providence Journal discusses the Red Sox' strategy under the new CBA, and how they were able to land high upside high school players like Ty Buttrey. 2012 draft picks have begun being assigned to the Red Sox affiliates. Deven Marrero hit his first professional home run after being assigned to the Lowell Spinners this week. High school draft picks Ty Buttrey and Jamie Callahan were assigned to the Gulf Coast League. As always, check out the team roster page for the most up to date roster assignments. Not that you don't love our voices, but this week the SoxProspects.com Podcast let you hear from the players directly, featuring interviews with Iglesias, Marrero and supplemental round selection Pat Light. The International League announced its All-Star roster this week, and four PawSox made the cut. Catcher Ryan Lavarnway, first baseman Mauro Gomez, infielder Pedro Ciriaco, and starting pitcher Justin Germano will all partake in the game and Arnie Beyeler will manage the IL squad. Tim Britton of the Providence Journal talked to Pat Light about another former New Jersey high school pitcher, Anthony Ranaudo. Alex Speier of WEEI.com compared Oscar Tejeda to Will Middlebrooks after both were teammates at Salem in 2010. Tejeda was claimed by the Pittsburgh Pirates when the Red Sox had to make room when Zach Stewart and Brent Lillibridge who came over in the Youkilis deal. Matt Eddy of Baseball America reported this week that the Cubs released former Red Sox minor league first baseman Jair Bogaerts, younger brother of Xander Bogaerts. Jair was the player who went to the Cubs as part of the Theo Epstein compensation package. -The two things that jumped out after getting the initial look at Deven Marrero were his athleticism and quick hands during his swing. Although Marrero served as the designated hitter and did not play the field, his athleticism was on display as he ran the bases. He got out of the box well and was very fluid with his actions in going from first to third. Marrero’s hands are the strength with his swing. Although on the level side, he is fluid using his hands to start his load quickly and pull them in as he brings the head of the bat through the zone. There is not much more room on his frame to fill out, but he has the type of hands to stay inside of the ball and produce backspin. He shows a feel for hitting and how to control the head of the bat. -Jose Iglesias was finishing up his rehab assignment after a lay-off due to a back injury, but the underlining theme of my scouting opportunities the last two years continued to show. There is a lot of work to go handling breaking balls. Iglesias has improved with shrinking down his strike zone, but has a tough time keeping his hands back when trying to attack secondary offerings. His hips open up quickly, which causes him to bring his hands too far forward along his body. This results in Iglesias only being able to lunge at the ball and leads to a lot of weak contact. Without much power, it is important for him to be able to stay back to utilize his batspeed and square offerings up. Iglesias’ below-average pitch recognition hinders his offensive game. It shows with how he gets in-between fastballs and appears to be guessing in counts. So far this season, he does not look much closer to being ready to handle major league pitching than at the end of 2011. -Newly acquired Zach Stewart heavily relied on his 88-91 mph two-seam fastball during his first outing with Pawtucket. Stewart showed strong feel and pitchability with the offering, pounding the lower tier of the strike zone on both sides of the plate for most of his six innings of work. Although a bit of a short-armer, he is consistent with his delivery and there is not a lot of wasted effort that could tire him out. His two-seamer is a contact inducing pitch and is not going to miss bats. At times, he did miss spots with the pitch and worked up in the strike zone. The damage was minimal at this level, but a major league lineup would have done more with the mistakes. Stewart’s four-seam fastball has regressed since seeing him last season with Manchester and he has lost some feel for it. The arm-speed was there, but it lacked life and topped out at 92 mph a couple of times. The return of his ability to utilize the four-seamer to throw it past hitters is key, if he is to be successful at the big league level. Stewart’s 82-85 mph slider was the only offering that missed bats in the outing and hitters began laying off of it after the first trip through, keying in early on the two-seamer. Northeast Scout Ian Cundall checks in with some observations after spending the last week covering Lowell and Pawtucket. -While extremely young and filled with potential, Williams Jerez has a long way to go, especially at the plate. Presently, Jerez has well-below average pitch recognition and really struggles picking up breaking balls, especially from left-handers. He is consistently out in front of those offerings, resulting in some ugly swings against bad breaking balls in the dirt. If he does make contact, it’s often a weak groundball chopped to the right side as he commits too early and is unable to wait back on the pitch. Jerez’s struggles against breaking balls also impacts his ability to hit fastballs. When down in the count, Jerez can get caught guessing breaking ball, causing him to be late on fastballs. When this occurs, Jerez tends to slash at the ball and if he makes contact, it’s generally weak and to the left side. As noted in a prior first-hand report, Jerez swing looked defensive, but a follow-up look showed a more aggressive swing, where he tried to attack the ball. The best example of this occurred when he got a fastball away, which he attacked and lined hard into the left-center gap for a double. Jerez still struggles with fastballs on the inner half and needs to work on pulling his hands in to hit inside the ball. One tool Jerez has impressed with so far in initial looks has been his speed. At the plate, Jerez has turned more than one ball in the gap into a double and he has multiple infield singles due to his speed which grades as plus-to-better. In the field, while his routes are still a work in progress, he can easily make up for a poor read using his long strides to track balls in the gap. -Kendrick Perkins generates plus raw power and when he squares the ball up he produces strong backspin. Perkins has a fluid swing with a slight uppercut, which generates loft. At this point, he is a dead fastball hitter, but when he gets a pitch in his wheelhouse on the inner half, he does a good job driving the ball. Perkins is in the initial stages of developing an approach, thus he tends to try to cheat on the inside pitch. As a result, fastballs on the outer half give him a lot of trouble. He doesn’t do a good job staying on these pitches and has shown little ability to drive the ball to left field. Perkins also really struggles with pitch recognition, specifically on curveballs. He over commits early to hit fastballs and often gets caught out in front of the pitch resulting in him swinging with only his hands when he gets an off-speed pitch. If he makes contact against these offerings it’s generally a weak groundball chopped to the right side. On one occasion, Perkins waited back on a slider, lining it hard to right for a single, but that was the only time he made solid contact against an off-speed pitch in the three games I’ve seen him play thus far. As Perkins makes his way through the New York-Penn League a second time, his ability to hit off-speed pitches will continue to be tested, thus strides he makes in pitch recognition are key for his development. -At the plate, Ryan Lavarnway could contribute to a major league team right now. He looks extremely comfortable in his at-bats, doing a great job staying back on the ball. In past looks Lavarnway’s swing has looked a little long at times, but Wednesday night his swing was shorter and more compact. He picked up three hits, all of which came against fastballs on the outer half. His first hit came on a fastball, which he muscled down the right field line for a double. The ball wasn’t hit well and had a lot of topspin, but Lavarnway had the strength to still drive the ball. In his next at bat, Lavarnway got a fastball down and away and used a smooth, compact swing to punch to ball to right field. The pitch was located well, thus Lavarnway was focusing on making contact rather than driving the ball. Similarly, in his third at-bat, Lavarnway punched a fastball past the second baseman for a single. He put a very similar swing on the ball as in his previous at-bat, but in this instance the pitch was up in the zone and a great pitch to hit. In past looks, this was a pitch Lavarnway has driven into the gap or for a home run as it was in a location where he could extend his arms and elevate the ball. Lavarnway did get fooled a few times by off-speed pitches, and in his final at-bat he was caught out in front of a slider, which he reached for and rolled over to third base. Behind the plate, Lavarnway had a relatively easy game as all the Pawtucket pitchers commanded the ball well. His arm was only tested once, with the runner stealing second. He registered a 2.08 pop time, (2.00 is what you would like to see), and the ball seemed to float a little to second base. Overall, I would grade his arm as fringe-average (45 on the 20-80 scale). 6/29 Cup of Coffee: It was a night of exciting action and big performances down on the farm. Jackie Bradley, Jr. and Deven Marrero stayed hot to lead Portland and Lowell, five home runs and 18 hits powered Salem on a night when Matt Barnes was not at his best, while Pawtucket had a night much like the major league club with Brandon Duckworth in the Franklin Morales role. In an 11-inning thriller at McCoy, Pawtucket fell to the Charlotte Knights (CWS) by a score of 1-0, foreshadowing Boston's tough night out in Seattle. Brandon Duckworth was exceptional, throwing 7.0 shutout innings, allowing only two hits, and striking out five without walking a batter, but Charlotte's Simon Castro matched him pitch for pitch. Junichi Tazawa followed Duckworth with two perfect innings of his own, striking out four. SoxProspects.com northeast scout Ian Cundall was in attendance, and he reported it was the best velocity he'd seen out of Tazawa since his 2010 Tommy John surgery, topping out at 96 mph. The Knights finally broke the scoreless tie in the 11th as major league veteran Greg Golson knocked a solo home run off of Will Latimer, who took the loss. The PawSox collected only five hits in the contest, and only Alex Hassan was on base more than once, going 1 for 3 with a walk. Portland escaped with a 4-3 win over the New Hampshire Fisher Cats (TOR). What seemed like the same story every night in the first half for Salem has turned into a recurring theme since his move north - Jackie Bradley, Jr. led the charge with yet another big night, going 2 for 4 with a double, run scored and an RBI. He hasn't missed a beat since his promotion - literally - as his sterling 1.006 OPS at Portland exactly matches his number at Salem. Bradley's RBI single in the third started the scoring, and he came in to score on a double by Bryce Brentz. Catcher Dan Butler continued his excellent month of June (.305/.423/.508), doubling and scoring what proved to be the winning run. There was also promising news on the mound, as Anthony Ranaudo had an encouraging performance, allowing only two runs on six hits in 5.0 innings. He walked three and struck out three. Recent independent league signee Jason Urquidez picked up the win in relief, and Aaron Kurcz struck out three in 1.1 scoreless innings to earn the save. Both the weather and the bats were scorching in Salem. On a night where the thermometer read 96 at first pitch, the Red Sox held off the Potomac Nationals (WAS) in a 16-14 slugfest that saw a combined 43 baserunners and the two teams collect 18 hits apiece. Top prospect Matt Barnes was roughed up in his worst outing as a pro, laboring through 32 pitches in his 1.0 inning, giving up three runs on four hits and a walk. The offense picked him up in a big way though, scoring six in the first, eight in the second and two in the third while the bullpen held on for dear life. The Red Sox offense had five home runs in the explosion. Xander Bogaerts hit his 12th of the year, and his eighth in the month of June. Brandon Jacobs hit his sixth round-tripper, along with his 19th double of the season, and Shannon Wilkerson, Michael Almanzar and Heiker Meneses all went deep as well. The most impressive line of the night belonged to Sean Coyle, who has been showing signs of breaking out of a season-long slump recently. Coyle went 4 for 5 with a double, and RBI and two runs scored. After hitting only .211 in the first half, Coyle has gone 11 for 27 since the break. Greenville could not capitalize on several opportunities in a 4-2 loss to the Rome Braves (ATL). Rome made four errors, but Greenville went only 2 for 9 with runners in scoring position in defeat. David Renfroe went 2 for 4 with a pair of RBI singles to provide the scoring for the Drive. Garin Cecchini went 1 for 3 with a walk, and stole his 27th base of the year. Yeiper Castillo dropped his third consecutive decision, falling to 3-4 on the year, as his allowed three runs on five hits in 5.0 innings of work, striking out five and walking three. After falling behind early, Lowell came back to sink the Vermont Lake Monsters (OAK) 6-5. Number one draft pick Deven Marrero continued the excellent start to his pro career, going 3 for 5 with a run scored and his first stolen base. After falling behind 3-0, a Kendrick Perkins home run got them on the board in the fourth. The following inning, the Spinners loaded the bases with one out, and things started to unravel for Vermont, as a pair of throwing errors led to three runs scoring, putting Lowell up for good. 2011 second-rounder Williams Jerez went 2 for 4 on the night. Francisco Taveras picked up the win in relief, throwing 4.0 shutout innings, allowing three hits while striking out three and walking four. The GCL Red Sox bats were quieted by the GCL Orioles in a 7-2 loss. The good news came on the mound, as starting pitcher Frank Montas was again very sharp, throwing 3.0 scoreless innings, allowing three hits and striking out four without giving up a walk. It is the second consecutive scoreless outing to start the season for Montas, likely the hardest thrower in the Boston system. In the third game of his rehab stint, Carl Crawford went 1 for 3 with a walk at the plate, but the big story was that he reported no pain after a throw to the plate from left field. Three of the five Red Sox hits came off the bat of Jesus Loya, playing right field in his first start of the season. In a heartbreaker, the DSL Marlins walked off with the 4-3 win against the DSL Red Sox. There were several positives on the night, however, starting on the mound, where starter Edwar Garcia went 6.0 full innings, a rarity in the DSL. The tall 18-year-old righty allowed only 1 unearned run on three hits. He did not allow a walk and struck out four, facing only 21 batters in those six innings. At the plate, Manuel Margot continued to make a name for himself, going 2 for 5 with a triple and an RBI. A center fielder who came in with an excellent defensive reputation, Margot is excelling with his bat as well, with a .305/.392/.524 line and 12 stolen bases in 13 attempts. Raymel Flores, a regular shortstop who was in the lineup yesterday as the designated hitter, also went 2 for 5, and also added a triple, his league-leading eighth on the year. Anthony Amaya added three hits and Alixon Suarez had two for the Red Sox. Player of the Day: There are many worthy candidates, with several excellent performances on the day both at the plate and on the mound, but the nod here goes to Pawtucket starter Brandon Duckworth. While he received no offensive support, he pitched his best game of the year, allowing only two hits in his 7.0 innings of work. The veteran righty lowered his ERA on the season to 3.39. Sorry this one is a bit late this week folks, but I was motivated at least in part to wait until the Sox’ three Florida draftees’ signings to become official. As a bonus, we get a big ol’ international bonus baby to talk about. Bradley’s breakout season finally earned him the bump to Double-A, with the long-stranded Linares returning to Pawtucket, where he probably could have been all along. Bradley has not only moved himself up 16 spots in the SoxProspects.com rankings since the start of the year, but he has also put himself into a discussion for top 100 prospect lists. Our Director of Scouting Chris Mellen gave us The Book on Bradley this week. Linares’ season has been curious. He absolutely dominated Double-A, but a player who impressed in major league camp last spring and started that year in Pawtucket before suffering a season-ending ankle injury in May should have done that. 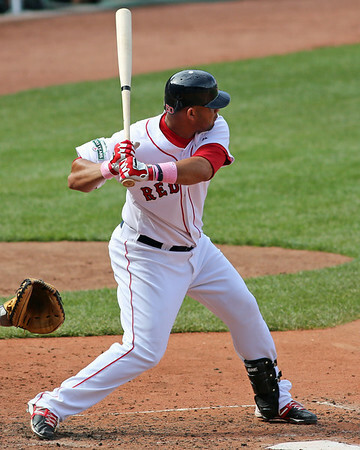 He has been slowed by injury a bit this year as well, which may have delayed his return to Pawtucket. LeBlanc, well, he’s just happy to be here. After struggling in Greenville last year to a .223/.257/.294 line, he was a bit better at .264/.336/.388 this year. He will see plenty of time in the Salem outfield rotating with Shannon Wilkerson and Matty Johnson. Looking at the fallout, in Pawtucket, the outfield is suddenly very crowded. Linares will take over as the regular right fielder, with Alex Hassan in left, Che-Hsuan Lin in center, and Jason Repko and Josh Kroeger mixing in when possible, with one of the five getting an occasional start at DH when Lars Anderson or Mauro Gomez gets a night off. Scott Podsednik will begin a rehab assignment soon, crowding things even more. Meanwhile, in Salem, Brandon Jacobs got to play a couple games in center following Bradley’s promotion, but don’t read into that too much. When that occurred once earlier this year, Chris speculated that it was to get Jacobs a bit of a different perspective in the outfield. You can be sure that Jacobs will not be playing center regularly anytime soon. Per usual, I will refrain from getting into the major league ramifications of this one. Stewart, a former top 50 prospect, reported to Pawtucket, where he moves into the rotation after spending all of this year in the White Sox’ bullpen. The once-promising prospect has lost some velocity off his fastball, as his sinker is down around 90-91 at this point. He featured that and a slider out of the bullpen, but the Sox think he can be a starter with three good pitches. We shall see where this experiment goes—for this deal to be anything beyond giving Youkilis away, Stewart needs to get a couple ticks back on that sinker. Both Chris and our Notheast Scout Ian Cundall saw Stewart’s debut on Wednesday night, in which he went 5.2 innings, allowing one run on six hits, striking out four with no walks. Look for reaction here and in our next podcast. As for Tejeda, it was clear he was destined to come off the 40-man roster, and soon. In his second year in Portland, he was hitting .262/.294/.396 as a 22-year-old. The fact is he has had one good season at the plate above Lowell, and now that he is a left fielder, that just is not going to cut it. Pittsburgh is a popular landing spot for former Sox minor leaguers, as Tejeda joins Brandon Moss, Craig Hansen, Yamaico Navarro, Argenis Diaz, Dusty Brown, Hunter Strickland, Jeff Corsaletti, Freddy Sanchez and others as former Sox minor leaguers to join the Pirates, whether by trade, free agency, or otherwise. With Florida knocked out of the College World Series relatively early, the Sox were able to complete the signings of their picks from the first ten rounds. Johnson received $1.575 million, exactly slot for the 31st pick, which was unexpected—our Editor-in Chief Mike Andrews had him pegged to go below slot by as much as $500k. Meanwhile, Maddox signed for $350,000, or $50,500 below slot for his pick. The three Gators, Johnson, Maddox, and Larson, are in Lowell, while Conklin and Briscoe reported to the Gulf Coast League. The Sox have now spent $7,042,000 on bonuses for the first 10 rounds, going over their bonus pool allotment of $6,884,800, which was expected. The club can spend up to $7,229,040 without giving up a draft pick next year, so the club does have about $187,040 left to spend on bonuses above $100,000 for players selected outside the first round. That will not be enough to sign the likes of Carson Fulmer (15th round) or Alex Bregman (29th round), but could be enough to bring, say, 11th-round pick Jamal Martin into the fold. The club has signed 20 of its draft picks so far. Typically, the club signs between 23-29 players, although that was back when the draft went 50 rounds instead of its current 40. Lin received a $2.05 million signing bonus, a figure surely affected in part by the changing rules for international free agents that go into effect on July 2—in short, just like the draft, teams will have a cap on their international amateur spending. With clubs not wanting to count Lin’s bonus toward their 2012-13 cap, he likely had a bit of leverage, and thus earned the highest bonus ever for a position player from Taiwan. Lin is a strong defensive shortstop who needs some work at the plate. He has been assigned to the GCL Sox, and my bet is he reports to Lowell next season. Here's some more on Lin's signing. A lot to like there. Mark Prior placed on Pawtucket DL, Will Latimer assigned to Pawtucket from Portland (6/23): Well, it was just a matter of time. Prior suffered a strained oblique, which likely contributed to a sudden downturn in his performance, as he gave up three runs in his last two appearances after baffling hitters over his first five. The Sox will take this slow, since there likely is no room for him in Boston until September anyway. Jose Iglesias placed in Lowell on a rehab assignment (6/22); activated from DL (6/26): Iglesias played six innings on Friday night and the whole game on Sunday, and he looked like the Iglesias we know and love: fastest hands on defense in the game, still a bit fooled by breaking balls, but getting a couple good cuts on some fastballs in the box. I would be surprised if he goes up to Boston before September in the interests of getting him some regular at-bats. Quick side note: I have long had a hunch that he was the type of player that, without becoming an attitude problem or anything, was board with the minors and would flourish in the majors. Talking to him after the game in Pawtucket on Sunday, I felt like I could hear in his voice that he wants to be back in the bigs. Listen for yourself here. Marco Duarte suspended for 50 games by MLB (6/22): It has been rare to see a Red Sox minor leaguer suspended for violating the league’s drug program. Duarte tested positive for an amphetamine. I would not be surprised if he is released this offseason; the Sox do not take these suspensions lightly. Jason Repko (rehab) transferred to Pawtucket from Greenville (6/19); activated from MLB 60-day DL and outrighted to Pawtucket (6/22): Once one of the last players cut from the opening day roster, and a short-term injury replacement in center before succumbing to the hex plaguing the Sox outfield this year, Repko was passed by Daniel Nava and Podsednik on the depth chart while he was injured, and thus is in Triple-A for the foreseeable future. Keury De La Cruz and Yeiper Castillo activated from Greenville DL (6/20): Yaaaaay health. Jeremy Kehrt assigned to Portland from Pawtucket (6/26): Jeremy had to make his weekly appearance in the First Take. Ronald Bermudez activated from Pawtucket DL (6/20); placed back on DL (6/22): This is the life of a Triple-A fifth/sixth outfielder. Scott Swinson assigned to Salem from Greenville (6/21): Swinson is kind of stuck between Low and High A right now. He’s been stellar for the Drive (47.1 IP, 40 H, 10 R (9 ER), 9 BB, 31 K), but gotten lit up for Salem (11.1 IP, 16 H, 12 R (10 ER), 3 BB, 9 K). Jose Vinicio and Leonel Escobar placed on Greenville DL, Dreily Guerrero assigned to Greenville from Lowell (6/22): Vinicio and Escobar went on the DL with a left shoulder contusion and thirdcatcheritis, respectively. That said, allow me to state that I have no clue why Jordan Weems and his .100/.250/.125 June line are still in Greenville, as Oscar Perez, Tim Roberson, and JT Watkins will not play ahead of him in Lowell. Guerrero is a utility player who may stick around the system for a bit because he can play so many positions. Red Sox sign Matt Nevarez from Wichita of the American Association (6/21), assign him to Greenville (6/22), and then release him (6/23): Wait, what??? I will be honest, I have never seen anything like this. Chances are he was acquired to be an extra arm, but then when Justin Erasmus came off the DL, he was asked to go on the phantom DL and declined. Or at least that’s the most plausible thing I can come up with. Minor league baseball, folks! 6/28 Cup of Coffee: Pawtucket got their first win in over a week, Greenville picked up their first victory in four games, while all the other affiliates dropped their respective contests. The PawSox picked up their first win in ten games with a 5-1 victory over the Charlotte Knights (CWS). Pawtucket got their first run of the game in the second inning when Lars Anderson doubled and was driven in on an Alex Hassan single. In the bottom of the third, Jason Repko singled to reach base, followed by a Ryan Lavarnway single that advanced Repko to third. Mauro Gomez followed with a three-run homer to left field to give the PawSox a 4-0 lead. Pitching had a great night, too. Zach Stewart got the start, and was in the game until there were two outs in the top of the sixth. Stewart let in three hits and one run in the sixth, and was replaced with two outs and two on by Will Inman. Stewart threw for 5.2 innings with six hits, one run, and no walks and picked up his first win with the PawSox. Inman pitched 0.1 innings with no hits, no runs, no walks, and a strikeout. Daniel Bard took the mound in the top of the seventh and pitched 1.0 perfect inning with no hits, no runs, and no walks. In the bottom of the seventh, Nate Spears doubled followed by a single from Jon Hee that advanced Spears to third and a single from Pedro Ciriaco that drove Spears in. Garrett Mock came out to pitch in the top of the eighth and went 2.0 innings with two hits, no runs, and no walks. In total, PawSox batters had 12 hits on the night. Every batter in the lineup minus J.C. Linares recorded a hit and Lavarnway led the team with three. The Sea Dogs fell to the New Hampshire Fisher Cats (TOR) for the second night in a row in a 6-3 loss. In the bottom of the first, Jeremy Hazelbaker doubled to reach base. During the next at bat, Hazelbaker stole third and was driven in on a sacrifice fly to left field from Bryce Brentz. New Hampshire picked up their first run in the top of the second against Portland starter Jeremy Khert. Khert was rocked in the third, giving up five hits for three runs, but stayed in until the fifth inning. In total, Khert pitched 5.0 innings with 11 hits, four runs, and no walks, he was credited with his first loss of the season. Caleb Clay took the mound in the top of the sixth. Clay gave up two runs in the seventh inning and pitched 3.0 innings for five hits, two runs, and no walks. In the bottom of the sixth, Jackie Bradley doubled, advanced to third when Hazelbaker grounded out, and scored when Marquez Smith doubled. The Sea Dogs ninth inning rally attempts fell short, scoring only 1 run when Matt Spring homered. The Fisher Cats out batted the Sea Dogs 16 to 9 in the contest. Bradley and Smith led Portland batters with two hits each. The Salem Red Sox fell 5-3 in a barn-burner against the Winston-Salem Dash (CWS). Keith Couch was the starting pitcher for the Red Sox and gave up a run on three hits in the bottom of the first, and another run off of two hits in the second. Couch pitched 5.0 innings with six hits, two runs, and three walks. He was replaced by Michael Gleason who took the mound in the bottom of the sixth. Gleason gave up three runs in the seventh inning on a three run homer, but otherwise kept the Dash at bay, pitching 3.0 innings with three hits, three runs, and two walks. On the offensive side, Salem put up their first runs of the game in the top of the third. Drew Hedman reached base on a walk, followed by Sean Coyle getting hit by a pitch. Lucas Leblanc then grounded into a double play that got Coyle out at second but advanced Hedman to third. Matty Johnson then tripled, scoring Hedman, and Heiker Meneses singled to score Johnson. The Red Sox put up another run in the top of the eighth when Johnson reached base on a single, advanced to second on a wild pitch, and scored on a Meneses single. Salem batters had eight hits total on the night, Johnson leading the crew with three. The Drive beat the Rome Braves (ATL) 6-1, getting their first win after a three game losing streak. Greenville picked up the first run of the game in the top of the third inning. Keury De La Cruz reached base on a single, advanced to second on a wild pitch, advanced to third on a passed ball, and scored on a Blake Swihart single. The Drive put up another run in the top of the fifth. Garin Cecchini singled, followed by a Boss Moanaroa walk, and the pair stole third and second bases, respectively. Henry Ramos then singled, driving in Cecchini. The Braves answered in the bottom of the fifth, putting up a run against Drive starter Jason Garcia. Garcia pitched 6.0 innings with five hits, one run, and two walks. In the top of the seventh, Ramos homered, giving the Drive a 3-1 lead. Justin Erasmus took the mound for the Drive in the bottom of the seventh and pitched 2.0 innings with two hits, no runs, and no walks. Greenville added to their lead in the top of the ninth. 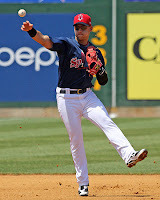 Cecchini reached base on a single and stole second base during the next at bat. Moanaroa drew a walk, and Ramos singled, scoring Cecchini and driving Moanaroa to third. Ramos advanced to second on a throwing error, followed by a sacrifice fly ball to right field from Swihart that scored Moanaroa and advanced Ramos to third. Cody Koback was hit by a pitch, and during the next at bat, Ramos stole home. In total, the Drive had 13 hits on the night; Ramos led the pack with three. The Spinners couldn't stop the Tri-City Valley Cats (HOU) eighth inning rally and lost 2-1, their fifth in a row. In the top of the first inning, Matt Gedman gave Lowell their only run of the game when he drew a walk and then scored on a fielding error during David Chester's at bat. Spinners starter William Cuevas had an excellent outing, throwing 6.0 innings with three hits, no runs, and one walk. He was replaced in the bottom of the seventh by Jadd Schmeltzer. Schmeltzer gave up two runs to Tri-City in the bottom of the eighth and in total threw for 3.0 innings with five hits, two runs, and one walk. He was credited with a blown save and picked up his second loss of the season. Unfortunately, the Spinners were unable to provide their pitchers run support and answer the Valley Cats' late rally. Lowell batters had just three hits on the night, compared to Tri-City's eight. The GCL Red Sox fell to the GCL Orioles (BAL) in a 3-1 loss. The Red Sox put up the first run of the game in the bottom of the first when Cleuluis Rondon singled, advanced to third on a Jose Colorado single, and was driven in when Kevin Mager grounded into a force-out. The Orioles answered in the top of the second with a homer off of Red Sox starter Sergio Gomez. Gomez gave up another run to the Orioles in the third, and in total pitched 4.0 innings with three hits, two runs, and one walk with six strikeouts. He was replaced in the top of the fifth by Jeffry Fernandez, who pitched two solid innings before giving up a run in the top of the seventh and being replaced with one out and two on by Robby Scott. Fernandez pitched 2.1 innings with two hits, one run, and one walk, while Scott pitched 0.2 innings with no hits, no runs, and no walks. Ricardo Betancourt took the mound for the Red Sox in the top of the eighth and pitched 2.0 innings with two hits, no runs, and no walks. The GCL squad had seven hits in the game, Rondon leading the pack with three. The DSL Red Sox rallied in the ninth inning, but couldn't stop the DSL Mets2 in a 6-5 loss. Raymel Flores led off the top of the first with a triple, and scored thanks to a sacrifice fly to right field from Andres Garcia. The Mets answered with a run against Red Sox starter Keivin Heras in the bottom of the first. Heras stayed in the game until the fifth, pitching 5.0 innings with two hits, one run, and no walks. Enfember Martinez took the mound for the Red Sox in the bottom of the sixth and gave up a run that inning. Martinez came out of the game in the bottom of the eighth with two on and one out and was replaced by German Taveras. In total, Martinez pitched 2.1 innings with five hits, two runs, and no walks. In the top of the ninth, Alixon Suarez drew a walk, Anthony Amaya was hit by a pitch, and Roberto Duncan walked to load the bases. Osvaldo Almengo drew the third walk of the inning, scoring Suarez. After a pitcher change, Flores and Garcia both walked to send Amaya and Duncan across the plate. Manuel Margot walked after another pitcher change to walk in the fourth run of the inning. In the bottom of the ninth, Taveras let in one run and was replaced with one out and one on by Leonel Vazquez. Vazquez gave up a triple and a single to give the Mets two more runs and the walk-off win. Taveras pitched 1.0 inning with two hits, no runs, and no walks. Vazquez pitched 0.0 innings with two hits, one run, and no walks. The Red Sox had six hits on the night. Players of the Night: Mauro Gomez, who's three-run homer helped to lead the PawSox to their first victory in 10 games, and Henry Ramos who homered, stole home, and went three for four with two RBI in Greenville's win over the Braves. SoxProspects.com Player of the Week Pawtucket's Ryan Lavarnway posted a roubust .579/.625/1.000 line (11 for 19) powered by one home run and five doubles in five games played last week. He also scored and batted in four runs each and took four bases on balls. Lavarnway recorded a hit in each game last week, including three multi-hit games, highlighted by a 4 for 4 performance at Syracuse (WAS) last Wednesday in which he hit two of his doubles. On the season he is hitting .320/.405/.489 with seven home runs 17 doubles and 32 walks versus 43 strikeouts in 225 at-bats over 60 games played. 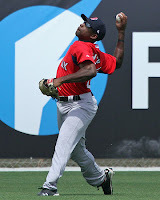 He is currently the fifth-ranked prospect in the organization by SoxProspects.com. Pitcher of the Week Salem's Brandon Workman made his only start of the period on Sunday against Winston-Salem (CHA) but he made the most of it, working seven shutout innings and allowing only two hits and one walk while striking out three and earning the win. Thus far in 2012, Workman owns a 5-3 record with a 2.78 ERA in 64.2 innings of work over 12 starts, allowing 20 earned runs on 49 hits, striking out 58 while walking only 14 and holding opposing batters to a .211 average. 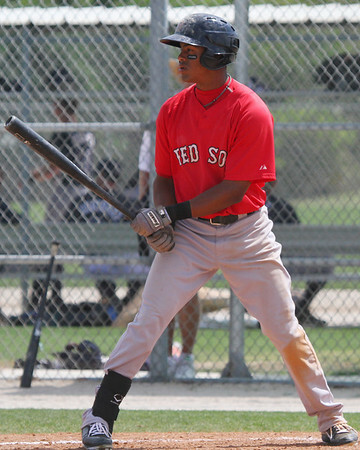 He is currently the thirteenth-ranked prospect in the organization by SoxProspects.com. The Red Sox have inked shortstop Tzu-Wei Lin from Taiwan to a $2.05M contract, reports SoxProspects.com Editor-in-Chief Mike Andrews, and assigned him to the Gulf Coast League. The money given to Lin equals the contract signed by first-round draft pick and fellow shortstop Deven Marrero. Lin, 18, is rated the #18 international prospect and the #1 prospect in Asia by MLB.com's Jonathan Mayo. He originally had an agreement with the Yankees as a 16-year-old in August 2010, but the $350K contract was apparently invalid and the deal fell through. Since that time, Lin's stock has only risen, winning the 2010 IBAF 18-under Player of the Year award, and dominating the 2011 Asian BFA Junior Tournament, going 10 for 21 with two home runs, eight RBI, seven runs scored and two stolen bases. The Taiwan Baseball Blog has an extensive scouting report on Lin, with the highlight his fantastic 3.79 speed to first base. His defense also rates as well above average, though there is the possibility that the combination of Lin's blazing speed, strong throwing arm, and the Red Sox' organizational depth at shortstop will result in a move to center field. While his small stature, standing only 5-foot-9 and weighing 155-160 pounds, contributes to what is considered below-average home run power, Lin profiles to hit for excellent gap-to-gap power due to his excellent hand-eye coordination and ability to square up on the ball. The contract is the second highest in major league history given to a Taiwanese player, trailing only the $2.2M deal given to Tsao Chin-hui by the Rockies in 1999. It is the largest bonus given to the Red Sox for an amateur player out of Asia, topping the $1.8M given to Junichi Tazawa in December 2008. The Pawtucket Red Sox have announced that four players have been named to International League team at the Triple-A All-Star Game: catcher Ryan Lavarnway, first baseman Mauro Gomez, infielder Pedro Ciriaco and starting pitcher Justin Germano. Manager Arnie Beyeler has also been named a coach on the team for his role in leading the PawSox to a share of first place in the North Division. The game will be played on July 11th at Coca-Cola Field in Buffalo. Lavarnway has come on very strong in the month of June, hitting .403/.464/.694 in 18 games on the month to raise his overall season line to .312/.400/.480. The sixth-round draft pick out of Yale in 2008 will be making his second All-Star team, as he was also named to the 2010 Carolina League squad while a member of the Salem Red Sox. Gomez, 27, is making his second consecutive appearance in the International League's midsummer classic. The first baseman, signed as a minor league free agent in the offseason, went 0 for 1 with a walk in the 2011 game while wearing a Gwinnett Braves uniform. Along with a sterling .304/.366/.600 batting line, Gomez leads the league with 24 doubles and is in the top ten in hits, runs, RBI, home runs, and slugging percentage. He also appeared in two games for the major league club in mid-May, going 0 for 2. Ciriaco had a standout spring training, earning himself a long look for a major league roster spot, and has continued his solid play into the regular season. He currently has a batting line of .307/.327/.418, and has split his time between second base and shortstop, showing off solid glove work. The 26-year-old minor league veteran has made two previous All-Star teams: in the Low A Midwest League in 2006, and the Double-A Southern League in 2008, both while in the Arizona Diamondbacks organization. Like Ciriaco and Gomez, Germano is another minor league free agent having an excellent year with the PawSox. The 29-year-old righthander, a 13th round pick of the San Diego Padres in 2000, will be making his first All-Star appearance at any professional level. With an 8-4 record, 2.60 ERA and league-leading 97.0 innings pitched, Germano has stepped up as the ace of the Pawtucket staff. His 1.2 BB/9 rate is good for second in the league, and he ranks in the top ten among starters in both ERA and WHIP. 6/27 Cup of Coffee: Salem pulled out the lone affiliate victory of the day as pitching was suspect in the majority of Tuesday’s contests. Pawtucket’s recent struggles continued as they were blanked by the Charlotte Knights (CHW), 8-0. Billy Buckner was rocked in his 4.2 innings of work, allowing eight runs on eight hits and a walk, striking out six. Tony Pena added 3.1 innings of scoreless relief, allowing three hits and punching out two. Jose Iglesias returned to the PawSox lineup for the first time since May 25, going 0 for 5. The loss is Pawtucket’s ninth straight defeat, as they are tied for first place with the Lehigh Valley IronPigs (PHI). A deadlocked extra inning tussle broke the wrong way as the New Hampshire Fisher Cats (TOR) sank the Sea Dogs, 5-3 in 13 innings. Chris Martin hurled the first 6.0 innings for Portland, allowing two runs on seven hits and a walk, striking out three. Josh Fields added 3.2 innings of scoreless relief, allowing a walk and striking out four. Chris Balcom-Miller received the loss for his lone inning of relief, allowing two runs on four hits. Down 3-0 in the seventh, the Sea Dogs pulled to within one on an RBI single from Jeremy Hazelbaker. In the ninth, Portland loaded the bases with nobody out before a run scoring double play tied the game, 3-3. The Sea Dogs had a golden opportunity in the 11th, having runners at the corners with one out before Dan Butler grounded into an inning ending double play. The Fisher Cats received a two run home run in the top of the 13th to take home the victory. Only four members of the Portland lineup mustered a hit, with Jackie Bradley, Derrik Gibson, Peter Hissey and Hazelbaker each collecting three. Unliked their Double-A counterparts, the Salem Red Sox nipped the Winston-Salem Dash (CHW), 6-5 in 13 innings. Charle Rosario received the start for the Red Sox, tossing 5.0 innings, allowing four runs on four hits and two walks, striking out three. Andrew Jones picked up the victory for his 2.0 innings of scoreless relief, moving to 3-1 on the season. Down 2-0 in the third, the Red Sox cut the lead in half on a Shannon Wilkerson RBI single. Trailing 5-1 in the seventh, Salem once again pulled to within a run, plating three on a throwing error and a Travis Shaw RBI single. Wilkerson delivered big time in the ninth, roping a one out RBI double to tie the game, 5-5. In the 13th, Christian Vazquez's RBI single broke the deadlock and gave the Red Sox a 6-5 advantage they would not relinquish. Wilkerson and Vazquez each had three hits to lead the Salem offense. Greenville lost a heartbreaker, allowing the Rome Braves (ATL) to walk off with a 3-2 victory. Noe Ramirez continued his stellar start to 2012, tossing 6.0 innings, allowing two runs on six hits and a walk, striking out four. Matty Ott added 2.0 scoreless innings of relief, allowing just two hits. Nathan Striz, making his Drive debut, received the loss for allowing the winning run on two hits in his 0.2 innings of work. With the game scoreless in the fourth, Greenville grabbed a 2-0 lead on RBI singles by Henry Ramos and Cody Koback. Rome tied the game in the bottom half of the inning and the two teams remained deadlocked into the later innings. In the bottom of the ninth, Rome staged a two out rally to bring home the winning run. Garin Cecchini stole his team leading 24th base in the contest, good enough to place him fifth in the South Atlantic League. Lowell’s power display was not enough to save them from a 10-5 defeat at the hands of the Tri-City Valley Cats (HOU). Raynel Velette received the loss for his 4.1 inning performance, allowing six runs (five earned) on eight hits and a walk, striking out two. Yunior Ortega tossed 3.0 innings of relief, allowing four runs on five hits and two walks, striking out two. The Spinners grabbed a quick 1-0 lead in the first as Matthew Gedman laced an RBI single. With the game tied in the fourth, Lowell took a 2-1 lead on a Kendrick Perkins solo home run. Down 7-2 in the sixth, the Spinners pulled to within three on a Gedman two run home run. In the seventh, Deven Marrero smashed his first professional home run to bring the Spinners to within two, 7-5. Tri-Country added three more runs in the eighth and cruised to victory. After beginning the season 4-1, Lowell has now dropped four straight contests. The GCL Red Sox were unable to get in both games of their doubleheader against the GCL Rays as they were once again postponed by rain. The DSL Red Sox were doubled up by the DSL Mets2 (NYM), 12-6. Dioscar Ramirez struggled in his 3.1 innings of work, allowing six runs (four earned) on seven hits and two walks, striking out three. Yankory Pimentel added 2.1 innings of relief, allowing six runs (five earned) on four hits and two walks, striking out a pair. Finding themselves in a deep 12-0 hole in sixth, the Red Sox finally got on the board on an Alixon Suarez RBI ground out. In the eighth, the Red Sox scored their second run of the game on a Robert Del Rosario solo home run. In the ninth, the Red Sox rallied for four runs on a Kevin Segovia RBI single, Raymel Flores RBI triple and an Andres Garcia RBI ground out. Despite the loss, the Red Sox remain in first place with a 14-7 record, one game better than the DSL Mets2. Player of the Night: Shannon Wilkerson, who went 3 for 6 with a double, two RBI and a run scored in Salem's 6-5 victory over Winston Salem. Jim Callis of Baseball America is reporting that the Red Sox have signed the second of their two first-round picks, left-handed pitcher Brian Johnson. The 31st overall pick in the draft, Johnson will receive the slot-recommended bonus of $1.575M. Johnson is with the Lowell Spinners tonight in Troy, NY as they take on the Tri-City Valley Cats, reports Florida Today. 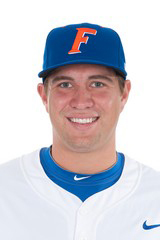 The 6-foot-3, 235 pound lefty threw 90.0 innings with the University of Florida, going 8-5 with a 3.90 ERA and a 1.167 WHIP, walking 18 and striking out 73. The Red Sox expect these numbers will improve as Johnson, an excellent two-way player in college, is able to focus exclusively on pitching. Two of Johnson's fellow Florida hurlers drafted by the Red Sox have also been with Lowell. Third-round pick Austin Maddox is expected to sign for $350K, under the recommended $400K for the slot, according to Alex Speier of WEEI.com, and his deal should be finalized soon. Greg Larson, the club's 20th-round selection, officially signed on Monday. Using these figures, the club has spent roughly $7,046,000 on their 11 picks in the first ten rounds. This is slightly over the $6,884,800 cap the Red Sox had to spend, but by staying within $344,240 of that cap, the team will not have to forfeit a draft pick in 2013. They now have about $183,000 left over to spend on draft picks outside of those first ten rounds. 6/26 Cup of Coffee: It was a tough night on the farm, as only the DSL Red Sox were victorious. The GCL Sox were rained out, and the other five teams combined to score only seven runs in a very light hitting night. Pawtucket's troubles continued, as the Louisville Bats (CIN) completed the four-game sweep with a 6-3 victory. The loss was the eighth consecutive for the PawSox. Things started off well, as Pedro Ciriaco led off the bottom of the first with a double and scored on a Ryan Lavarnway single. Louisville broke even in the top of the third, but Pawtucket scored a pair in the bottom half of the frame. Jonathan Hee led off the inning with a double followed by a Ciriaco triple. A Jason Repko sacrifice fly scored Ciriaco and gave the PawSox a 3-1 lead, but it would be all Louisville from there. Justin Germano took his first loss since May 19, which was also the last time he'd allowed more than two runs. He finished giving up four on eight hits in 7.0 innings pitched, striking out six and walking only one. A pair of solo homers allowed, one in the fourth and another in the sixth, proved to be his undoing. Alex Wilson followed, giving up two runs (one earned) on three hits in his 2.0 innings. Ciriaco went 2 for 4 with a double, triple, RBI and two runs scored. Lavarnway also finished 2 for 4, continuing his resurgent June and extending his hitting streak to seven games. After a solid but unspectacular start of the year, Lavarnway is hitting .412 with 13 extra base hits and 18 RBI on the month. Portland managed only four hits in a 7-1 loss to the Trenton Thunder (NYY). Hot Yankees prospect Vidal Nuno dominated the Sea Dogs lineup, shutting them out over 7.0 innings while allowing only two hits. Drake Britton matched zeros with Nuno through the first four, but the Thunder finally struck with a run in the fifth to take the lead and four in the sixth to knock Britton out of the game. In 5.2 innings, Britton gave up five runs (three earned) on five hits, striking out six and walking four in taking the loss. Jason Urquidez, signed last week from Lancaster of the independent Atlantic League, made his Sea Dogs debut in relief. He allowed two runs, both unearned, on two hits in 1.1 innings, striking out one. Aaron Kurcz struck out two and hit a batter in a hitless ninth. Nick Natoli was the only Portland player on base more than once, going 1 for 2 with a walk and a double. Bryce Brentz hit his 10th home run of the year in the ninth inning to avoid the shutout. Jackie Bradley went hitless for the first time since his promotion to Double-A. Like Portland, Salem mustered only four hits, while the Winston-Salem Dash (CWS) scored early and often in an 8-0 victory. It was a difficult start for Miguel Celestino, as he finished only 2.0 innings, allowing seven runs on seven hits including a pair of home runs. He struck out two and walked one as his ERA ballooned from 3.06 to 3.88. Manny Rivera put out the fire in long relief, tossing 4.0 shutout frames, allowing just two hits, walking three and striking out one. Ryan Pressly, in his second appearance since moving to the bullpen, gave up a run on four hits in 2.0 innings. He struck out one and did not walk a batter. Meanwhile, Dash starter Matthew Heidenreich was fantastic, going the distance to complete the four-hit shutout. A Greenville comeback fell short as the Drive fell to the Rome Braves (ATL) 4-2. Mickey Pena was not at his sharpest, giving up four runs (three earned) on five hits in 5.0 innings, walking one without registering a strikeout. In a four run deficit, Greenville looked to mount a rally in the fifth inning as Rome pitcher Navery Moore struggled with wildness. After Bryan Johns was hit by a pitch to lead off the inning followed by walks to Jose Garcia and Keury De La Cruz, giving the Drive the bases loaded with nobody out. Unfortunately for Greenville, Garin Cecchini grounded into a 4-6-3 double play. Johns scored, but that was still an exchange Rome was happy to make. Boss Moanaroa followed double scored Garcia to bring the Drive within two, but that is as close as they would come. Greenville relievers Nefi Ogando and Tyler Lockwood combined four 3.0 shutout innings to keep the Drive in the game. Greenville's offense would have more opporuntities, but was unable to capitalize. In the sixth, Jordan Weems was thrown out at the plate trying to score from second on a Garcia single, and in the eighth the Drive left the bases loaded. Moanaroa finished 2 for 4 with a walk, and Drew Turocy also had a two-hit evening. Lowell never led, dropping the first game in their series with the Tri-City ValleyCats (HOU) by a score of 7-1. After three scoreless innings, the ValleyCats got to Spinners starter Jacob Dahlstrand for three runs in the fourth. Dahlstrand completed 5.0 innings, allowing three runs on three hits, walking three and striking out one. Leandro Marin allowed a run on one hit in his 1.0 inning of work out of the bullpen, adding a walk and a strikeout. Braden Kapteyn struggled with his control on his 2.0 innings, giving up three runs (two earned), on only one hit, as he walked four and hit a batter. He also notched three strikeouts. The Spinners only run came in the sixth, as Seth Schwindenhammer tripled and scored on an Oscar Perez single. First-round draft pick Deven Marrero had another good night at the plate in his second game, going 3 for 4. At the other end of the spectrum, Kendrick Perkins continued to struggle mightily, going 0 for 4 with 4 strikeouts, the sixth time in seven games he has struck out multiple times. The GCL Red Sox game yesterday afternoon against the GCL Rays was postponed by rain. No word on whether the game will be made up. The lone win of the day came from the DSL Red Sox, who put 25 men on base in an 11-5 win over the DSL Yankees2. The Red Sox got the scoring started in the second when Anthony Amaya singled to score Aneudis Peralta. A five-run explosion in the third as the Red Sox sent 10 men to the plate broke the game open. The big hits a two-run home run by Robert Del Rosario and a two-run double by Amaya. After the Yankees got a run back, the Red Sox scored four more in the sixth, including a two-run homer by Alixon Suarez. The Red Sox added another in the seventh to go up 11-1, and the four run rally by the Yankees in the eighth barely made a dent. Suarez had a huge night, going 4 for 5 with two doubles and the home run, scoring a pair and driving in three. Manuel Margot also got on base four times to continue his impressive professional debut. Margot went 1 for 2 with three walks, two stolen bases, and three runs scored. Luis Ortega was impressive on the mound. Drawing the start, Ortega got his first professional win, tossing 5.0 shutout innings, allowing four hits and striking out three without walking a batter. Carlos Garcia struggled out of the pen, giving up five runs on five hits in 2.0 innings. Edwin Osorio, William Gonzalez, and German Tavarez combined for 2.0 shutout innings to seal the victory. Player of the Day: Catcher Alixon Suarez went 4 for 5 to lead the DSL Red Sox offensive barrage. Suarez struggled in his DSL debut in 2011 as a 16-year-old batting only .224, but really has shined in his repeat engagement. He is now hitting .324/.460/.485 and has already equaled his 2011 total with nine extra-base hits.